We’re excited to welcome Dødheimsgard, Bölzer, Blaze of Perdition & Matterhorn at our Warm-Up Party on Thursday 12th of December! 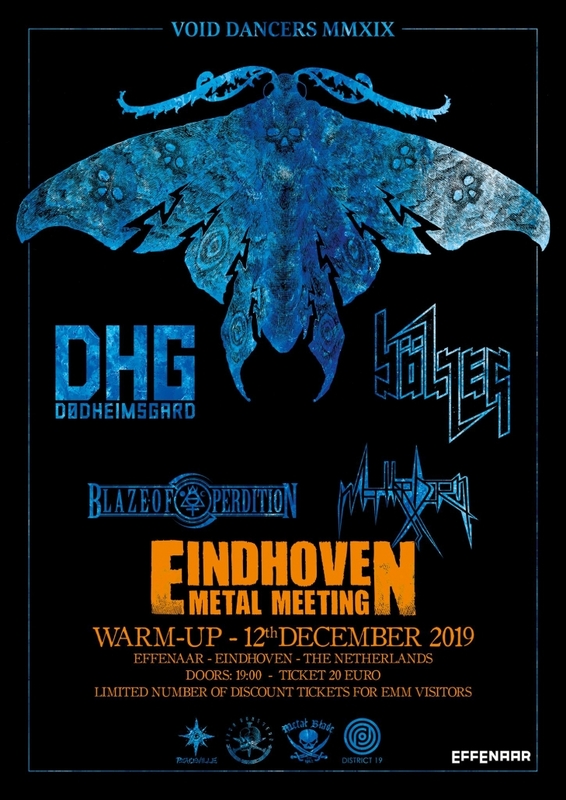 Regular tickets cost €20, Eindhoven Metal Meeting 2019 ticket holders receive a €4 discount. https://www.eindhovenmetalmeeting.com/wp-content/uploads/2019/03/EMM-logo2.png 0 0 dries https://www.eindhovenmetalmeeting.com/wp-content/uploads/2019/03/EMM-logo2.png dries2019-04-12 12:37:152019-04-12 12:46:10Warm-Up Party announced! TSJUDER, ALCEST and more announced for #emm19! With the addition of TSJUDER, ALCEST, HOUR OF PENANCE, SPECTRAL VOICE, ASAGRAUM, DARKFALL, LUCIFERICON & HELLFIRE DEATHCULT, the line-up for Eindhoven Metal Meeting 2019 is almost complete. Get your tickets now! https://www.eindhovenmetalmeeting.com/wp-content/uploads/2019/03/EMM-logo2.png 0 0 Willem https://www.eindhovenmetalmeeting.com/wp-content/uploads/2019/03/EMM-logo2.png Willem2019-04-06 15:04:512019-04-06 15:06:22TSJUDER, ALCEST and more announced for #emm19! M.O.D. confirmed for Eindhoven Metal Meeting 2019! https://www.eindhovenmetalmeeting.com/wp-content/uploads/2019/03/EMM-logo2.png 0 0 Willem https://www.eindhovenmetalmeeting.com/wp-content/uploads/2019/03/EMM-logo2.png Willem2019-03-24 17:07:272019-03-24 17:07:27M.O.D. confirmed for Eindhoven Metal Meeting 2019! Paradise Lost, Candlemass and more! 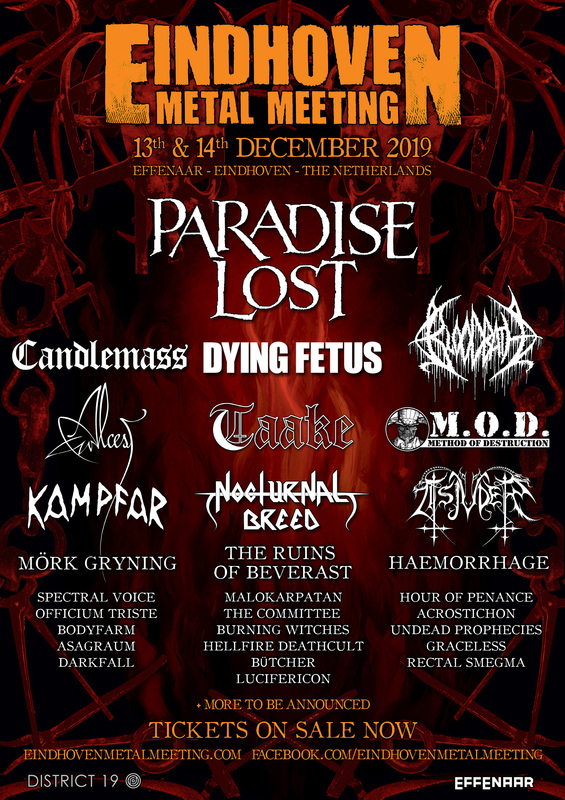 With the addition of Paradise Lost, Candlemass and Nocturnal Breed amongst others, the line up for this years Eindhoven Metal Meeting is heavier than ever! https://www.eindhovenmetalmeeting.com/wp-content/uploads/2019/03/EMM-logo2.png 0 0 Willem https://www.eindhovenmetalmeeting.com/wp-content/uploads/2019/03/EMM-logo2.png Willem2019-03-23 17:08:392019-03-24 17:09:05Paradise Lost, Candlemass and more!